I guess it’s just a coconut kind of week around here. Between the Coconut Sugar Scrub and this Coconut Sheet Cake, maybe my brain and kitchen are already on vacation! This is one of those cakes that is for people who don’t like to make things from scratch — people like my mom. I made this cake for my Mom on Mother’s Day by her request. And when I say request, I mean she handed me the old recipe card and said “Make me this!”. This cake is actually one of her favorites and is written down on a recipe card from the 90’s by an old neighbor (Hi Miss Roni!). It’s like those crockpot recipes that no one wants to admit loving…it’s a can of this, a can of that and a box of cake, but the finished result is delicious. Once it is all put together, you would never guess that this was such an easy (from a box!) cake! It’s very reminiscent of a Tres Leches cake with the liquids, but a much more fun flavor. Recipe Note: For extra coconut flavor, you can use a coconut cake mix instead! Also if you are not a Cool Whip fan, you can top it with homemade whipped cream instead! Bake cake according to directions in a 9×13 cake pan. 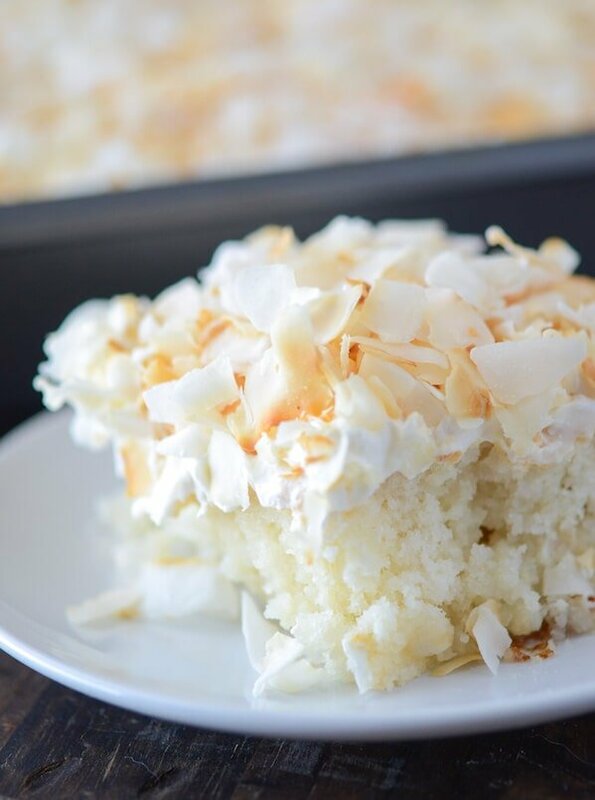 Let cake cool completely, then frost with Cool Whip and top with shredded coconut. Store in the fridge until ready to serve. So delicious! I love coconut! Coconut week!!! Definitely vacation mood! Oooh, this looks good – and easy enough for a non baker like myself! Thanks! Good lord, this looks good! I’ve made a cake with coconut cream once and it was without a doubt one of the best things I’ve tasted. So moist and coco-nutty! Nice job on the cake! I’m a big coconut fan and this looks tasty! This looks delicious! And I’m not even a coconut fan! Omg, this is dangerously EASY! I love that you used boxed cake mix, too. This wouldn’t take long or last long in this house! Look at how light and pretty this looks! Swooning, wish I had some now! Have a feeling this may become a staple at our backyard barbecues this summer!! Oh this is perfect…Love recipes that are passed down like this! I will def be making this. I love coconut! YUM! I love sheet cake – and I like this variation on the usual chocolate sheet cake! This looks wonderful 🙂 I love coconut cake, this recipe sounds perfect! Looks divine… condensed milk is an awesome touch. I made this cake for my Mom’s birthday. She is in LOVE with coconut and is now in love with this cake! I received so many compliments and people texting me that they want me to make it again! I love your blog!!!! I tried this out last summer; it’s known as my ugly cake. I thought I made a mistake in the recipe and covered it up with sliced bananas and fresh coconut “whip cream” Definately, a dinner party hit. oh my goodness i need this in my life. And in my belly. I really like coconut, but most people around me don’t! So I almost never bake anything coconut-ty. Wah waaah. I wish I was there to share this with you! I love this recipe! I added Moscato wine to the white cake batter and a little bit to the homemade whipped cream as well. The Moscato really richened the coconut dlavor without overpowering it. I also added sliced almonds and white chocolate chips to the topping because I didn’t have the patience to toast the coconut, but I still wanted the added texture. I’ve made this many times, but with one difference. I mix in a small box of instant coconut pudding, plus a few tablespoons of milk with the whipped topping before putting it on the cake. It adds a bit more coconut to the overload. Looks awesome! And finally…a blog that posts a recipe WITH a printer option!! Printing NOW 🙂 and making tonight! This sounds awesome and I would love to make it for my daughter’s birthday party! How far ahead do you think I can make it? Just baked this cake and it’s AWESOME! You’re right, it’s like the tres leches but less work and it tastes great! I will use it in the holidays for sure. Thanks for sharing this.